People are saying next Monday’s debate (Sept. 26th) will be the most watched debate in American history. You know why? Sheer entertainment. Will Trump brag about his yuge hands? Will Hillary faint dead away? In a year when anything can happen, well, anything can happen. And we’ve found some articles to convince you that it’ll be the Greatest Show on Earth. First, Jane Goodall says Donald Trump debates like a chimpanzee, according to the Washington Examiner. “In many ways the performances of Donald Trump remind me of male chimpanzees and their dominance rituals, “Jane Goodall, the world-famous primatologist and anthropologist, told the Atlantic’s James Fallows for a piece posted Saturday. Male chimpanzees try to impress rivals with aggressive behavior, Goodall said, such as stamping and throwing rocks. “The more vigorous and imaginative the display,” the more likely it is that the chimp will rise atop the hierarchy and remain. . . He made frequent self-aggrandizing references to his wealth and success, and even boasted at one point that he was well-endowed in terms of his male anatomy. Throughout this bizarrro 2016 campaign season, the two have become much more accustomed to trading jabs indirectly, through both the news media and social media outlets. With their supporters polarized and the candidates unable to dredge up much respect for each other amid the ideological and temperamental differences, the new phase of the election cycle — the debates — promise to be equally contentious and revealing. So, here’s how to watch the first 2016 presidential debate, because Clinton and Trump are sure to be on fire. . . The debates are a great indicator of how the respective candidates perform under pressure and how well they understand foreign and domestic policy and the many, many issues the nation is facing that the next president will have to address. On the other hand “Li’l” Marco Rubio lectured us that debates are supposed to be informative, not entertaining, according to Fox News. That was just before he crashed and burned. He said the bottom line is that this is not a sport or entertainment, it’s a presidential race. Well, maybe, but Trump gets the ratings. Remember last spring, when Trump said he’d skip the debate? The whole thing collapsed. That’s because we tune in to watch the car crash or Hindenburg explosion. Here’s a rundown of famous debate moments. Seriously, it’s about personality. The tanned and relaxed John F. Kennedy made the sallow and unshaven Richard Nixon look like a crook with his wit and drive in 1960. Ronald Reagan made President Carter look like Mr. Potato Head in 1980. 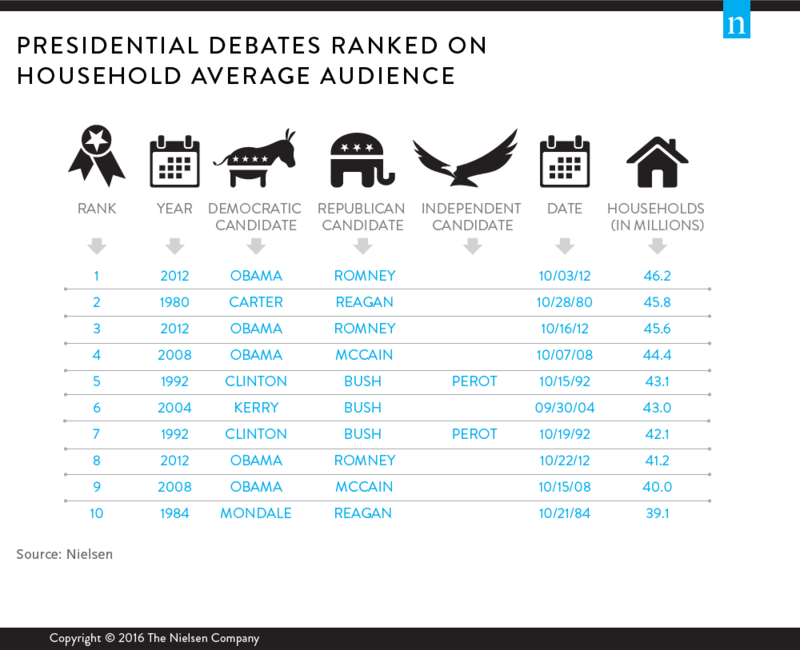 The debates have become popular entertainment, with big audiences, according to Forbes. In recent years, the public has tuned into the presidential debates in record numbers. According to Nielsen, six of the top 10 most-watched debates in American history occurred within the last three election cycles. Five occurred in just the last two election cycles. In 2012, over 40 million households watched the debates between Barack Obama and Mitt Romney. The first Obama-Romney debate was the most watched presidential debate in American history, drawing 46.2 million households and bumping the 1980 Carter-Reagan debate from number one. . .
At a minimum, the Clinton-Trump debates will draw far more viewers than the Democratic and Republican conventions. Donald Trump’s speech on the final night of the RNC drew 23.5 million households (and 32.2 million total viewers). Hillary Clinton drew 21.7 million households (and 29.8 million viewers). If history is any judge, at least 40 million households will tune in to watch the 2016 debates. Here’s the list of all-time top-ten debates. But face it. The reason most of us will tune in to look for the fails. Here is a presentation of historic fails in TV debates. Shouldn’t it be ‘Huge’ and not ‘Yuge’? Or did I miss something in school? Both Trump and Bernie pronounce huge as “yuge.” It’s sort of an ongoing joke.